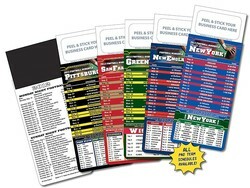 Want a quick handout to get your business or service noticed by sports fans? Add your business card you have an instant imprinted gift item for trade shows and sales meetings, political campaigns or sales prospecting. Just peel off the protective liner and press your business card onto the exposed adhesive for an instant imprinted specialty item. All pro teams available and 3 local college teams. Great to hand out as a political piece as you visit homes or as you walk in community parades. Some bigger areas have multiple college team choices so be sure to ask for those if interested. Min. is 100, sold in increments of 100. 100 or 200 50 cents ea, 300 or more 40 cents ea. #470133. 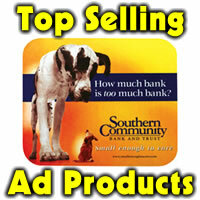 Email or call us for shipping estimate to get them to your zip code. Great item to share with multiple sales people in an office or team.